Nations Press news LOOK:DONATIONS FOR YOLANDA VICTIM'S DECOMPOSED!! 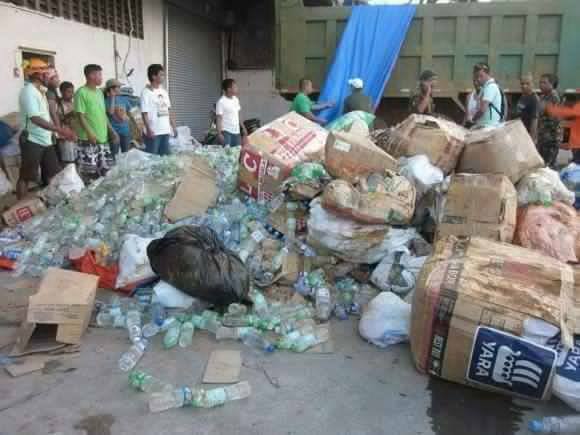 LOOK:DONATIONS FOR YOLANDA VICTIM'S DECOMPOSED!! Few year supertyphoon Yolanda damaged many areas and claimed thousands of lives in the Philippines, billions of aid poured in not just from other places in the country but also from foreign countries. There was an abundance of money, clothing, and food for the victims yet while the local officials had to deal with looting and lack of proper coordination in the distribution of these donations, there were also many items that were later discovered rotting in warehouses! A series of photos has once again surfaced online on Facebook page TNP – Trending News Portal, showing bundles and boxes of donated food and clothing which are now purportedly left rotting inside a warehouse allegedly owned by the Department of Social Welfare and Development (DSWD), a government agency. What angered netizens is that there were plenty of reports of typhoon survivors suffering days without food – and many have died in the aftermath of the supertyphoon, not from drowning but from lack of food and also of hypothermia from lack of proper clothing and shelter yet here are tons of food, water, and clothing which could have saved thousands of lives but are left to rot! Netizens hoped that the authorities will go after whoever was responsible for this mess – but we are also hoping that the government will develop some sort of system in handling and distributing donations so that this will never happen in the future.